For this new issue of our Web Performance barometer for french e-commerce, we looked at the beauty sector. We’ve selected a panel of 12 websites among best-sellers e-merchants (Sephora, Yves Rocher, Nocibé) on this market, but also renowned brands and retailers (Beauty Success, Bourjois, L’Occitane, L’Oréal Paris, Marionnaud, etc.) as well as a couple of pure-players like FeelUnique or Origines-parfums.com. As usual, we have mobilized the Dareboost test probes to perform hundreds of analyses per web site and measure their loading speed through a standard browsing context (desktop with an average ADSL connection) but also by simulating a mobile experience with a 3G connection. To learn more about this benchmark methodology, check the dedicated chapter at the end of this post. We decided to test only the websites’ homepages, as these pages are the main entry points for users. Therefore, be careful not to draw a quick conclusion about the overall websites’ performance. Most of the figures announced are medians (and not averages), in order to balance as much as possible any one-off inconsistent measures. Mobile Speed Index: more than 4 sec for the fastest site! With a median Speed Index beyond 6 seconds for our 12 sites panel, Dareboost records one of the worst results ever measured since the very first issue of our “e-commerce & web performance” benchmark. Indeed, only the toys and shoes online stores have reached such slow display performances. 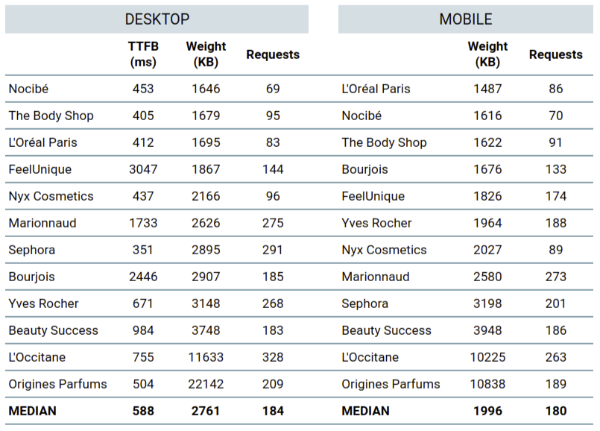 Furthermore, in these last two cases, a few websites have managed to stand out with much better Speed Indexes: 2531ms for Oxybul or 1839ms for Chaussexpo… Considering the current Beauty panel, The Body Shop actually takes the first rank with a mobile Speed Index of over 4600ms! In other words, whatever the site they choose, french mobile users wishing to buy cosmetics must be really patient. Similar findings for our desktop tests: the median Speed Index is 3200ms. once again, it is the slowest performance compared to all the other sectors already tested by Dareboost. 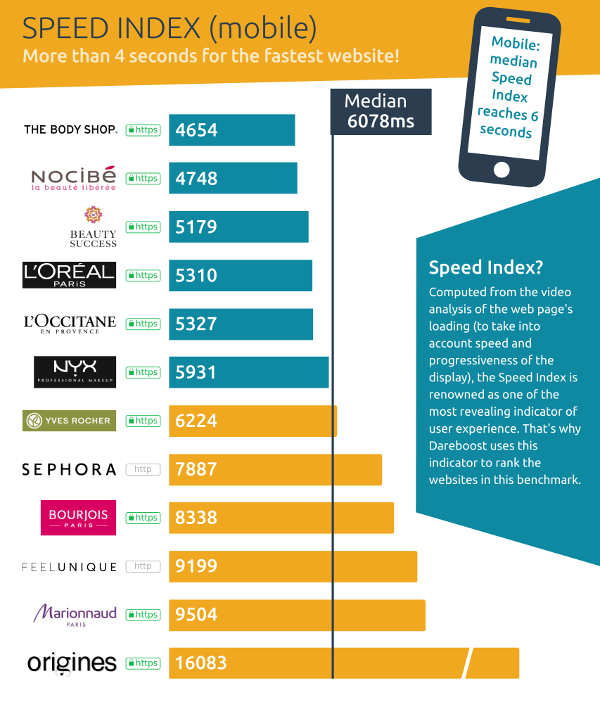 As shown in the picture above, only 3 brands obtain a Speed Index under 2 seconds: Nocibé (1579ms), The Body Shop (1714ms) and L’Oréal Paris (1808ms). As a reminder, Google recommends not to exceed … 1000ms ! Let’s check another indicator, just as interesting from a UX point of view: Start Render. As its name suggests it, this indicator measures the time spent by the user in front of a blank page, before the very first element is displayed on screen. With an important milestone to keep in mind: beyond one second of inactivity on the page, most users begin to feel impatient. 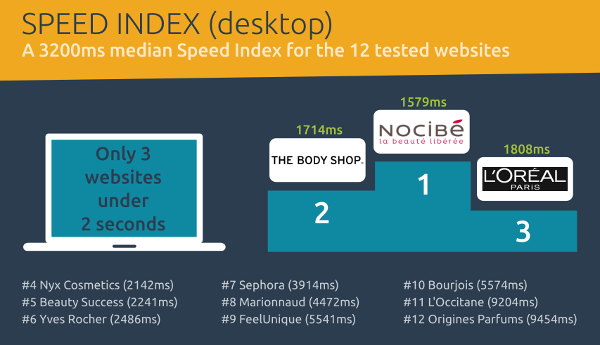 Regarding desktop tests, only L’Oréal Paris and The Body Shop manage not to exceed that psychological threshold, while Nocibé (1100ms), Nyx Cosmetics (1134ms) and Sephora (1234ms) are not too far away. 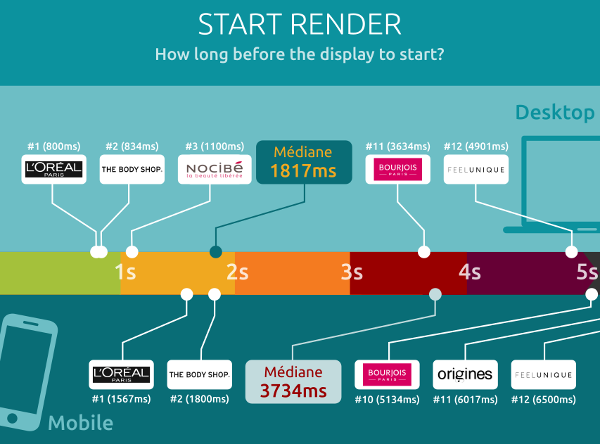 For the rest of the panel, the situation is much more complicated: for the 12 tested webstores, the median Start Render is 1.8 seconds on desktop and 3.7 seconds on mobile. One can easily imagine the harmful effect of such results on the business statistics of these e-merchants (bounce rate, conversion rate, etc.). What are the reasons for such poor results? Obviously, each website is a specific case and would require an in-depth analysis of the Dareboost reports. Still, this benchmark highlights some patterns. A high TTFB (Time to First Byte) – a fundamental metric for web performance (and SEO) – is one of these common issues. As a matter of fact, with this benchmark, we have measured a median TTFB of 588ms (desktop), almost 3 times slower than Google’s recommendation (less than 200ms). Even more surprising: none of the 12 tested sites obtained a satisfying result, since the one with the best TTFB (Sephora) is still at 351ms! Furthermore, the results for the slowest e-stores imply that they just cannot offer a correct user experience to their visitors: 1.7 seconds for Marionnaud, 2.4 seconds for Bourjois and even more than 3 seconds for FeelUnique! more than 250 requests to load the web pages of Sephora, Marionnaud or Yves Rocher. Let’s conclude this analysis with a positive note: among the 12 tested websites, 10 of them were offering secure connections (HTTPS). We have now even gone to 11 sites displaying the current small green padlock within the browser address bar: indeed FeelUnique was missing a full secure connection during our testing period because of a single HTTP image request. A glitch that has been corrected since then. Such a high proportion of secure websites has never been seen before for our french e-commerce benchmarks. On early 2016, we were stating on this blog that HTTPs was a requirement for any website… An imperative that the market has seemingly assimilated! To carry out this benchmark, Dareboost has tested the web performance of 12 e-commerce websites among the leaders of the french Beauty sector: Beauty Success, Bourjois, FeelUnique, L’Occitane, L’Oréal Paris, Marionnaud, Nocibé, Nyx Cosmetics, Origines Parfums, Sephora, The Body Shop and Yves Rocher. The tests (on homepages) were performed every hour (mobile version & desktop version) between May 18 and May 28 2018, representing over 400 tests per site and nearly 6,000 tests in total. Desktop: laptop computer (screen resolution 1366×768 px) with a Google Chrome web browser. Browsing from Paris with an Cable connection (8Mb/s downstream bandwidth and 50ms latency). Mobile: Samsung Galaxy S6 device, with a Google Chrome web browser. Browsing from Paris with a 3G connection (2Mb/s downstream bandwidth and 150ms latency). Note: some animations (automated carousels) were disabled during our tests to prevent any bias while measuring indicators like Speed Index. As a conclusion for this post, here is the complete infographic of this benchmark, published in partnership with the french leading retail magazine LSA. Feel free to share it! Interested in building the same kind of partnership with us in order to publish international benchmarks? Do not hesitate to contact us. We’d be glad to discuss this!